As a service to our customers, The Client Development Institute examines the difference between screened and unscreened applicants. Since the Select4Hire™ Integrity Test is only given to new hires, a built-in control group of existing, unscreened employees is automatically available. The differences in claim frequency and severity rates between screened workers and unscreened employees can be readily calculated. These “within year” studies provide an objective comparison of the difference in compensation losses between the two groups – even when multiple risk control strategies are implemented concurrently with Integrity Testing. For example, suppose you decided to implement the Select4Hire™ Integrity Test, a new return-to-work program, and new safety incentives all at the same time. How then can the impact of the Select4Hire Integrity Test™ be accurately measured when two other new programs are operating concurrently? Simple. All employees (screened and unscreened) receive the benefit of the return-to-work and safety incentive programs. Therefore, the only difference is that the Select4Hire™ Integrity Test screened the new workers. As almost all other risk control protocols apply to the entire workforce (new hires and existing employees), Integrity Testing provides a unique opportunity to measure its effects on workers’ compensation losses since it only applies to new hires. Over the past several years, Select4Hire has completed over a dozen major workers´ compensation benchmarking studies. The results of some of those studies are summarized below. 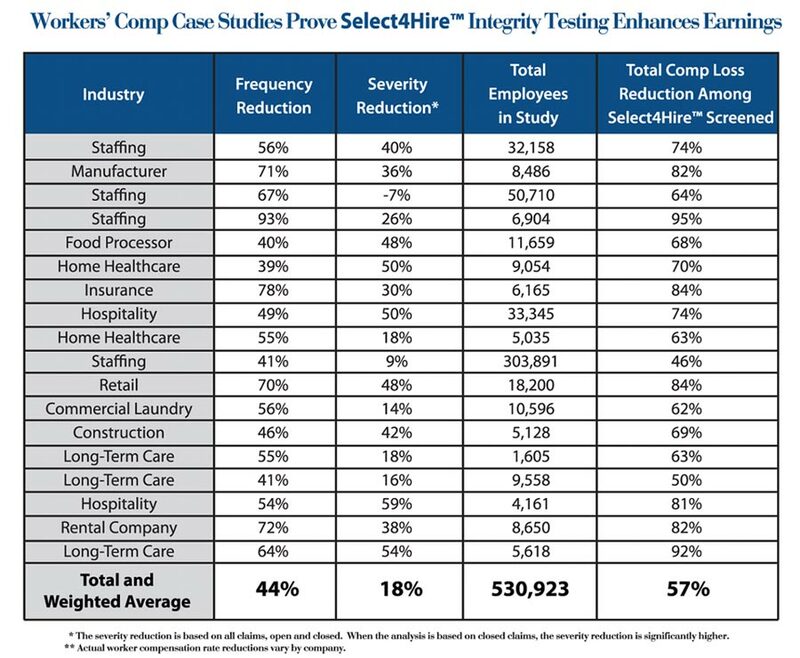 The average 57% comp loss reduction shown in the table below represents the combined effects of lower claim frequency and severity in workers surveyed by Select4Hire™ compared to unscreened employees working in the same type of jobs at the same time.